The letter falsely accuses Trump administration officials of causing children to be “torn away from their parents and placed in cages.” The letter then further falsely accuses the officials of negligence, which the letter says led to the deaths and sexual abuse of children. Anti-Trump groups often use the “family separation immigration policy” falsehood to attack the president and his supporters. In reality, Attorney General Jeff Sessions, responding to an influx of illegal crossings, ordered a lawful zero-tolerance policy under which anyone who crossed the border illegally would be prosecuted. President George W. Bush used a similar zero-tolerance policy to deter illegal crossings. The zero-tolerance policy resulted in the separation of illegal aliens from their children because when an adult is prosecuted for a crime his or her child cannot be taken to jail, the same as the standard practice for all U.S. citizens who commit a crime. Both the advertisement and the open letter perpetuate a debunked hoax suggesting that the Trump administration placed children in cages. The widespread falsehood was based on photographs taken of migrant children during the administration of President Barack Obama. The photographs were spread on social media with a caption falsely attributing the practice to the Trump administration. The Trump administration also gave migrants who were arrested and prosecuted for crossing the border illegally multiple opportunities to be deported together with their children. 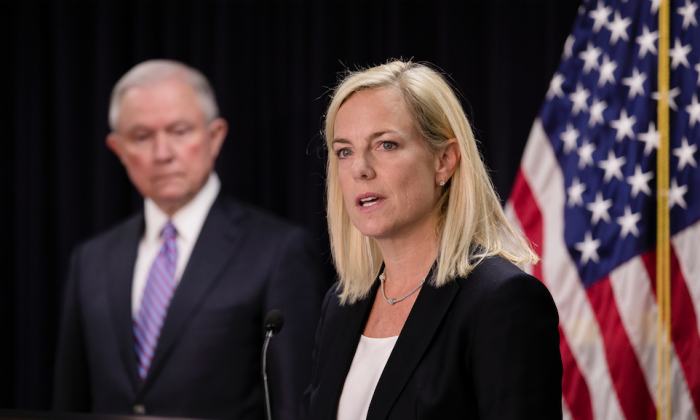 “There was no parent who has been deported to my knowledge without multiple opportunities to take their children with them,” Nielsen said at a House hearing on March 6. Immigration authorities are dealing with a surge of illegal aliens at the border at levels unseen for years. The number of illegal crossings is on pace to reach 1 million this year. Family units make up a large portion of those who cross the border illegally. Immigration authorities released more than 100,000 illegal alien family members into the United States this year. Under current law, immigration authorities can either briefly detain family units or prosecute the adults for breaking the law, resulting in separation. Trump has long pushed Congress to legislate a third option, which would allow for the immediate removal of entire family units.